CLEMSON, S.C. – February’s frigid temperatures could make spring and summer tiring seasons for South Carolina peach growers. Crop losses due to freezing temperatures likely will be minimal, said Gregory Reighard, a pomology professor at Clemson University, speaking at a peach grower update meeting in Edgefield this month. But the cold snap could condense the peach bloom period and subsequent fruit thinning window, he said. That will put logistical pressures on manpower. Peach trees are in a period of dormancy, a time in which a certain number of “chill hours” are accumulated while the flower buds are still dormant. The number of cold hours, or chill hours, during dormancy determine when varieties will flower and can impact fruit quantity and quality. Buds typically bloom in early March. 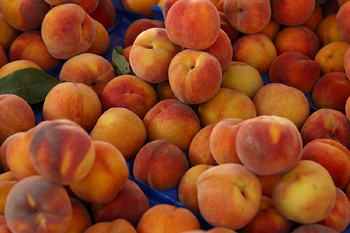 South Carolina grows around $64 million in peaches a year, according to federal data. As temperatures warm up, dormancy breaks and buds begin to open. At that point, a freeze like the one South Carolina is experiencing now would be more detrimental. Growers harvest more than $64 million in peaches a year, according to figures from the National Agricultural Statistics Service. That puts South Carolina second only to California in peach production, federal data shows. South Carolina’s predominant peach-growing region, known as “The Ridge,” from the western counties of Edgefield, Saluda, and Lexington, saw temperatures dip to 18 degrees in February. At those temperatures, trees could lose about 10 percent of flowers, Reighard said. If that’s the case, growers will still need to thin flowers on selected varieties anyway. Peach trees produce more blooms than they can support, so growers thin the blooms so flowers don’t compete for nutrients. Losing some blooms to frost, then, shouldn’t be a huge concern. Reighard recommended growers thin about 40 percent of flowers this year. A high number of chill hours will impact growers’ decisions on timing. Such a chill shortens the time flowers need to bloom and bunches together the bloom dates of different peach varieties. Typically, peach varieties bloom and mature at different points in a growing season. That spreads out the workload for growers. Trees are thinned to optimize fruit size. Growers must decide when to thin flowers: before they bloom, after they bloom or after the peach forms. The decisions made are critical to a field’s output. Clemson Extension agents will continue monitoring fields as more frigid weather arrives. “We try to monitor weather so we can make informed recommendations on managing crop loads by the timing of our pruning, early bloom thinning and follow-up green fruit thinning. Some years, like this one, these common management decisions are more critical,” Henderson said.